Tug the Free-Lance Bulldog at 2 years old—"He weighs 55 pounds and is 3 feet in length and 16 inches to the top of his head. 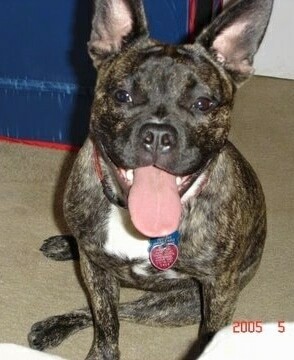 He is a French / English Bulldog and a very happy dog at that who enjoys his walks. Extremely affectionate and also loves to play. He does create lots of mischief if left alone in the house so we take him to a daycare where he can burn off some built-up energy." The Foxy Russell is not a purebred dog. 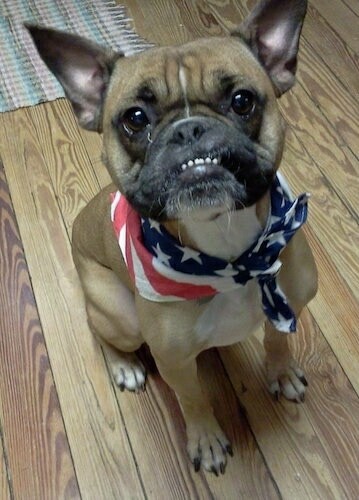 It is a cross between the English Bulldog and the French Bulldog. The best way to determine the temperament of a mixed breed is to look up all breeds in the cross and know you can get any combination of any of the characteristics found in either breed. Not all of these designer hybrid dogs being bred are 50% purebred to 50% purebred. It is very common for breeders to breedmulti-generation crosses. Hetti the Freelance Bulldog at 4 years old—"This is Henrietta or "Hetti". She is a 4 year old Free-lance Bulldog. She loves to sleep, play, and cuddle. She is very friendly, loving people and other dogs." Emmy the Freelance Bulldog pup at 10 weeks and 6 lbs. "This is my dog Pounder. She is 50% French Bulldog, 50% English Bulldog. She is fun loving and also very mischievous. She weighs roughly 55 pounds at age 4." Tug the Free-Lance Bulldog at 2 years old, weighing 55 pounds, on his way to doggie daycare, perfect for dogs whose owners work! 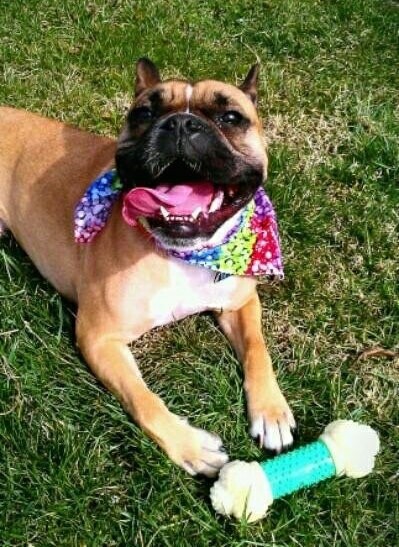 "Macy, a 50/50 French / English Bulldog from the UK at 18 months old and still a terror!"